Device-to-Device (D2D) communication will become a key feature supported by next generation cellular networks, a topic of enormous importance to modern communication. Currently, D2D serves as an underlay to the cellular network as a means to increase spectral efficiency. Although D2D communication brings large benefits in terms of system capacity, it also causes interference as well as increased computation complexity to cellular networks as a result of spectrum sharing. Thus, efficient resource management must be performed to guarantee a target performance level of cellular communication. 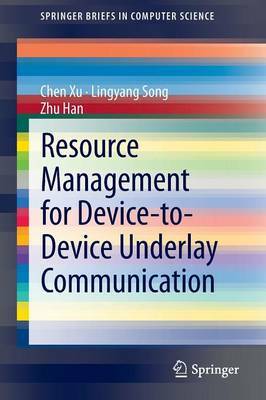 This brief presents the state-of-the-art research on resource management for D2D communication underlaying cellular networks. Those who work with D2D communication will use this book's information to help ensure their work is as efficient as possible. Along with the survey of existing work, this book also includes the fundamental theories, key techniques, and applications.